4 ports can charge any 4 USB devices at high speed simultaneously, 2 USB car charger ports are available for the front seat and another 2 ports for the back seat. Even if all 4 USB ports are occupied, each port can support up to 2.4A charging current. The USB extension cable has a reach of up to 1.8m giving you enough length for your car, truck, or van, which it's convenient for backseat passengers to charge when on long journey. iPhone X/8/8 plus/7 plus/7/6S plus/6S/6 plus/6/5S/5C/5/SE, Samsung Galaxy Note 8/S8 plus/S8/S7 edge/S7/S6 edge, Motorola, Blackberry, HTC, LG, Nexus, Sony, Huawei, ZTE, iPad Air/Pro/Mini, Kindle Fire, Tablet, Camera, PSP, Bluetooth headset, speaker, GPS etc. 1.Please check if your lighter socket has any debris or water. 2.Plug the car charger to your 12-24V car cigarette lighter socket. 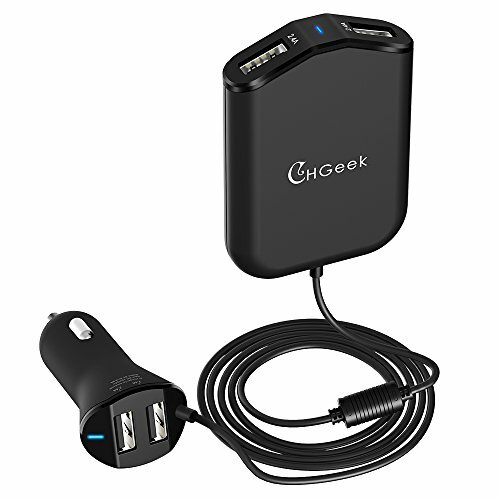 3.You could clip the charger to the pocket on backseat or other place you like, it will charge for any USB devices.